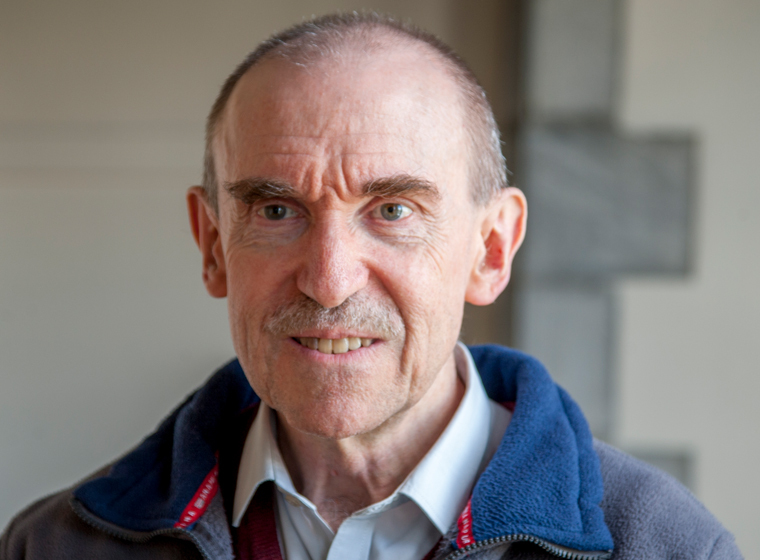 Father Paul Anthony Horrocks has been a Chaplain at the Lourdes Sanctuary for 15 years and will be moving shortly to Ireland to take up a new assignment. We sat down with Fr. Paul to find out a little more about him and his experiences at the Sanctuary. I was born on November 20th 1955 in Durban, South Africa, to Victor and Irene Horrocks. My brother Peter was 22 years older than me. My parents were a middle class family and were strong in their Catholic faith. I studied at a school run by the Marist Brothers. When did you know that your vocation was to the priesthood? As a young boy I was attracted to the priesthood but during my teenage years I was unsure if this was my vocation. I even pondered marriage and going to university. In my final year of school an experience with a non- believer brought my focus back to the priesthood. At the same time my father gave me a newspaper article on the life of Saint Maximillian Kolbe, and reading this article convinced me that the priesthood was my vocation in life. Tell us something about your preparation for the priesthood? In 1974, as soon as I finished my final school year, I joined the Oblate pre novitiate. After Philosophy, I spent a year helping with the Young Christian Workers (YCW) amidst many difficulties. Over the next few years, I completed my seminary studies and on February 19th 1982, I was ordained a priest. What made you decide to join the Oblates? I chose the oblates because my parish was run by them and I saw them as holy, down to earth men. Tell us about some of the places where you worked as a priest? When was your first visit to Lourdes? When I was three years old my parents brought me to visit my uncle in London and from there, we came to Lourdes on pilgrimage. 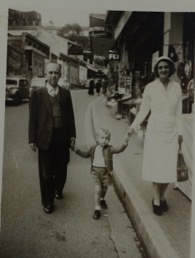 Paul, 3 years old, on his first pilgrimage to Lourdes with his parents on Rue de la Grotte. Do you have any memories of your first trip to Lourdes? Yes, I do have some memories of that trip. I remember going to the baths with my father and finding the water very cold. I wanted to get out immediately, but my father told me “kiss the statue of Our Lady and you can get out” , and I did this in obedience to him. I also remember washing my feet at the taps and a lady telling me not to waste the water. The third thing I remember is standing in front of the Rosary Basilica. Was your next visit to Lourdes when you came to work as Chaplain? No, I came in 1995 to serve as an auxiliary confessor for a month. How did you come to work as a Chaplain in the Sanctuary? In 2003, my Superior, visited Rome on work and was informed of a vacancy for an English language Chaplain in Lourdes. Being aware of my great devotion to Mother Mary, he recommended me for the position. I was accepted, and arrived in Lourdes the same year, on my birthday, to take up my duties. What effect has Lourdes had on your devotion to Mother Mary and St. Bernadette? In Lourdes, I discovered Mary as the mother of the Church. The faith of the sick and the caring and respect shown by their helpers, as well as the two daily processions are deeply symbolic of the life of the Church. I am quite amazed at how people are drawn to the Grotto for Mass, showing us how Mary leads us to her son in the Eucharist. I see St. Bernadette as an image of our Blessed Mother; a strong character, totally dedicated to the Lord and his Gospel. Here, Mother Mary has become more real to me. What can you tell us about your personal experience in Lourdes? In Lourdes, I have noticed that the Gospel is present in action more than words. What amazes me is that people sacrifice their time, spend their own money and come to serve “strangers” who are troubled and suffering physically and mentally. They pay to work instead of being paid! I feel humbled and blessed to be able to administer the Sacrament of Reconciliation. People come to confession, very often looking for direction. They come because they want to live their faith more fully. Many also come to find a new freedom, in and through Christ in the Sacrament, and this I found extremely enriching. It shows me how I still have to mature as a disciple of Christ and how Christ is truly at work today. Being with the terminally ill and bereaving, as they search for meaning and try to get beyond themselves, has also been very inspiring. As a priest in a parish, I was usually not as intensely focused on individuals. Living in a community with priests from different cultures, experiences and speaking different languages has also been very interesting and educational. I have come to understand the faith of people from different parts of the world and what is important to them in their spiritual journey. Do you know where your next assignment will be? I know I will be working in Ireland but I don’t know my exact assignment as I first need to get my Irish visa. I am sure that whatever my assignment will be, my experience in Lourdes will help me to serve those I minister to, in a caring and supportive way, so as to build a church community, witnessing to Gospel values, based on service, so evident here in Lourdes. Thank you Fr. Paul for spending time with us and we wish you all success in your new assignment. This article originally appeared on the Official Lourdes Sanctuary website.